The ACP Open “Nona – 75th Anniversary” in Tbilisi was won by none other than our own President Emil Sutovsky! The tournament saw a rather impressive field (with 18 GMs and 17 IMs participating) and it was organized by the Ministry of Sports and Youth Affairs of Georgia in cooperation with the Georgian Chess Federation and the ACP as a celebration of the legendary champion’s jubilee. Many extra-curricular activities took place during this remarkable event. There were six ACP wild cards in the tournament, each of them provided with special conditions and the ACP also donated 3000 EUR towards the prize fund of the event. There are more wild cards available for ACP Premiums. In July in Bergamo (15-17 July) there will be a place for an ACP Premium with full board and travel expenses paid; the Poikovsky tournament confirmed our wild card spot for the event at the end of July (the wild card to be awarded according to the ACP Tour standings on 1 June); the cooperation with Tata Steel Wijk aan Zee for its 2017 edition has been expanded – the official announcement to follow next week. Another good news is that ACP will have a wild card in the next cycle of FIDE’s Grand Prix, which will run in a different format as a series of Swiss events – the coveted wild card to be awarded based on the final standings of the ACP Tour 2015. 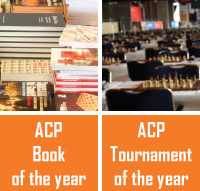 Do not forget the ACP Opens that are coming this summer: Porto Mannu (4-11 June), Warsaw (Najdorf Memorial, 8-16 July) and Jerusalem (Gideon Japhet Memorial 10-15 July) are all excellent events to be played! We hope you have a wonderful spring and a sparkling summer!